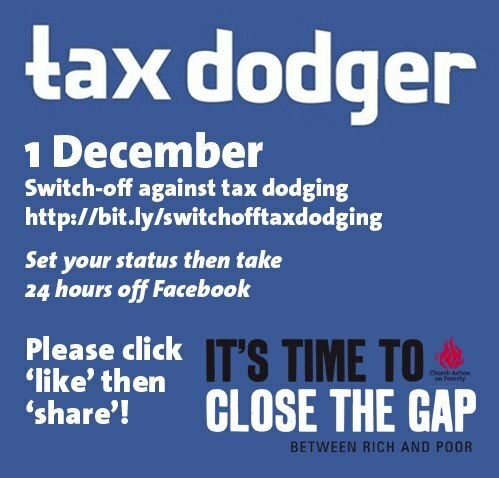 This weekend large numbers of people will switch off Facebook for a day in protest at the company’s tax dodging. Anti-poverty campaigners hope their message will go viral and alert users of the popular site to the company’s absent corporation tax. Church Action on Poverty have initiated the campaign after it was revealed that the company paid just £196,000 in corporation tax on estimated UK sales of £175million in 2011. We are asking supporters to share images with friends to advertise the action which has been set for Saturday 1 December. Participants are also encouraged to leave a message for their friends telling them why they’re switching off for the day. Every pound of tax dodged affects essential public services. The impact is increasingly being felt by individuals, families and communities across the country. The online protest is part of a wider push for governmental action on tax dodging through more transparency and better legal and financial support for HMRC in closing the £35billion ‘tax gap’. Tax is one of four strands in Church Action on Poverty’s campaign to ‘Close the Gap’ between rich and poor, alongside initiatives for Fair Wages, Fair Prices and a Fair Say for those cut out of decision-making. Get the full facts on the campaign here.